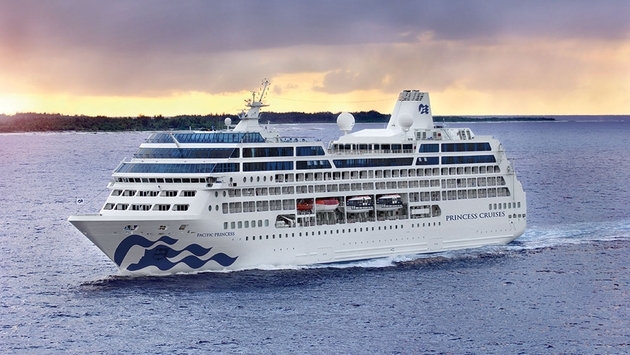 Princess Cruises’ sole small ship—the 670-guest Pacific Princess—has emerged from a two-week dry-dock refurbishment with a number of enhancements befitting the larger fleet. “We carefully considered how to incorporate modern design elements and comfort while keeping the traditional elements of small ship cruising that have always been the hallmark of Pacific Princess,” said Jan Swartz, Princess Cruises president, in a press release. The line’s multi-year “Come Back New Promise” enhancement program kicked off the updates, and among the multi-million-dollar improvements made to Pacific are new interior colors, patterns and textures—plus 178,000 square feet of new carpet—as well as the line’s signature new exterior hull livery. The classic “Sea Witch” logo now dons the bow larger than ever before. Overall, the ship maintains its existing Beaux-Arts aesthetic while also modernizing it, such as at the atrium. Lighter tones and style take inspiration from Central Park hotels in New York City. The ship’s four dining venues have also been enhanced, beginning with the pair of specialty ones. Sterling Steakhouse takes its cues from Rush Street Steakhouses of Chicago and Hollywood Brown Derby with black-and-white portraits of classic and modern film stars lining the restaurant. For Italian, Sabatini’s Restaurant has been updated with a contemporary look and a new forward lounge. The Club Restaurant steps across the pond to make the main dining room reminiscent of Central London. Rich woods are accented by light jewel-tones, modern furniture and updated carpets, drapes and chairs. The Panorama Buffet was similarly updated with new carpets, paint, tile, furnishings, drapes and awnings. Also, the pool deck outside the buffet was given a garden-style enhancement a la South Beach hotels thanks to new tile and refinished teak. Outdoor furniture here includes double bed loungers, sofas, lounge chairs and pool chaises. Meanwhile, 336 private staterooms were refreshed. New amenities include 700 Princess Luxury Beds developed in partnership with sleep expert Dr. Michael Breus and HGTV designer Candice Olson. Additionally, all accommodations received new carpet, upholstered headboards, modern drapes, along with lamps and sconces with incorporated USB ports. Suites also were improved with new modern furniture such as sofa sleepers, dining room table and chairs, lounge chairs and desks. Club Class Mini-Suites are also a new category available onboard complete with VIP perks. Special amenities encompass the reserved Club Class Dining area with preferred seating and an expanded menu, in addition to priority embarkation and disembarkation. Through December 2017, the Pacific Princess is scheduled to sail several European itineraries before embarking on its 111-day World Cruise from Los Angeles on January 20, 2018. This entry was posted in Uncategorized and tagged Beaux-Arts aesthetic, Come Back New Promise, dry dock, enhancements, Pacific Princess, princess Cruise, refurbishment, Sea Witch, world-class traveler. Bookmark the permalink.